The polls are open for poster Primary No. 2. Select one of the previous seven posters displayed on the site. Click here to view the candidates. The winner earns a ticket to the final, where it will go against other primary winners for the right to be named Wiz Readers' Choice 2009 Poster of the Year. The current leader in Primary No. 1 is Iowa State, which has a commanding lead over New Mexico State, North Texas and West Virginia. Here is a link to Primary No. 3, Primary No. 4 and Primary No. 5. Voting for all primaries will remain open until two days (48 hours) after our final team poster has been published (estimated to be Aug. 23). Posters are still trickling in, but we can say there will be at least six primaries. Troy Calhoun's two seasons have been a smashing success with records of 9-4 and 8-5. The Falcons play at Minnesota on Sept. 12, the first game in TCF Bank Stadium. Air Force travels to Navy on Oct. 3 and plays host to Army on Nov. 7 in its attempt to win back the Commander-in-Chief's Trophy for the first time since 2002. Thanks to Mark! Neil Callaway is only 6-18 in two seasons as coach, but there is hope entering the 2009 season. The Blazers return 17 starters, including 11 on offense. The schedule won't help. A four-week stretch includes road games against Troy, Texas A&M and Mississippi and a home game against Southern Mississippi. Thanks to Daniel! 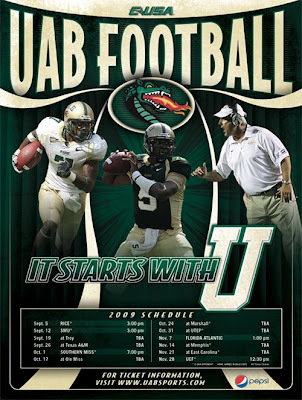 Poster designed by Old Hat Creative. Former Oklahoma State defensive coordinator Tim Beckman takes over for Tom Amstutz after a disappointing 3-9 record in 2008 that included a 13-10 victory at Michigan. Unfortunately, there aren't any gimmes on this fall's schedule. Toledo opens at Purdue, then plays host to Colorado before meeting Ohio State in Cleveland, technically a home game for the Rockets. The final tuneup before Mid-American Conference play comes Sept. 26 at Florida International. Thanks to Paul! A reminder to click the image to get an enlarged view. The Wildcats should get off to a fast start with home games against Towson (I-AA) and Eastern Michigan before a trip to Syracuse. Then comes a home game against Minnesota, a road game at Purdue and a home game against Miami (Ohio). Yes, a 6-0 start is a possibility. Thanks to Michael! The Cavaliers are coming off a disappointing 5-7 season and Al Groh, 56-44 in eight seasons as coach, is on the hot seat. Nonconference home games against William & Mary (I-AA), Texas Christian and Indiana are sandwiched around trips to Southern Mississippi and Atlantic Coast Conference opponent North Carolina.